Young refugees from Sudan's Blue Nile state collect water to wash with at Doro camp in South Sudan. 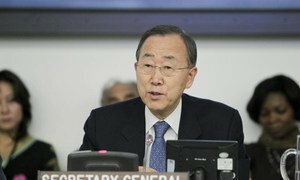 Secretary-General Ban Ki-moon today voiced concern over the lack of progress in talks to resolve post-independence issues between Sudan and South Sudan, as well as the possibility of an escalation in tensions after unilateral decisions taken by the two governments over their oil dispute. Mr. Ban urged both countries to re-commit to the negotiation process scheduled to start today in the Ethiopian capital, Addis Ababa, and reach agreements on all outstanding issues. “The moment has come for the leaders of both countries to make the necessary compromises, once again, that will guarantee a peaceful and prosperous future for both nations,” said a statement issued by the spokesperson of the Secretary-General. South Sudan became an independent State last July, six months after its people voted overwhelmingly to secede from Sudan. Tensions between the two countries over unresolved border disagreements have continued to simmer. A dispute over tariffs charged by Sudan on South Sudan for the use of a pipeline and port to export oil has recently further strained relations. Under-Secretary-General for Humanitarian Affairs, Valerie Amos, briefed the Security Council on the situation in South Sudan and told reporters afterwards that she had voiced concern that the country’s decision to suspend oil exports could undermine the Government’s financial capacity to respond to the humanitarian crisis facing its people. She also reiterated to the Council her concern over the lack of access by aid workers to Sudan’s conflict-affected states of South Kordofan and Blue Nile. In a related development, the UN High Commissioner for Refugees (UNHCR) said today it is seeking an additional $145 million to assist tens of thousands of refugees who have entered Ethiopia and South Sudan after fleeing fighting in Sudan’s Blue Nile and South Kordofan states. Heavy fighting between the Sudanese armed forces and the rebel Sudan People’s Liberation Movement-North (SPLM-North) in South Kordofan and Blue Nile has forced more than 130,000 people to flee, UNHCR spokesperson Adrian Edwards told reporters in Geneva. The agency anticipates that people will continue fleeing over the next months with clashes continuing and humanitarian conditions deteriorating in the conflict zones. Many of the refugees are staying in remote border areas close to the fighting. In South Sudan, Elfoj area in Upper Nile state and Yida refugee settlement in Unity state have both been targets of air raids. UNHCR has relocated some 20,000 refugees from unsafe border sites since 6 January, moving them to four new settlements. In Ethiopia’s Assosa region, the pace of relocation from border areas has also picked up in recent weeks as a result of fighting in Blue Nile and the end of the harvest season for farmers near the border. The two existing camps have reached capacity and new arrivals are being sheltered at a transit centre until a third camp can be built. In addition to the need for urgent relocation from volatile border areas, UNHCR’s emergency response includes the provision of basic relief items and services, registration and child protection. In December, the agency mounted a massive airlift to bring in supplies, including tents, plastic sheets, jerry cans and kitchen sets, to the refugees in South Sudan. UNHCR will also use the funds to build and service additional refugee settlements, improve road access and pre-position relief supplies ahead of the onset of the rainy season in April when many roads become impassable. The appeal for $145 million is in addition to this year’s budget of $269.1 million for programmes in Ethiopia and South Sudan. Meanwhile, the UN World Food Programme (WFP) reported that nearly five million people in South Sudan will face food shortages this year, as a result of poor harvests, soaring food and fuel prices, conflict and displacement. The agency was already planning to provide food assistance to 2.7 million people this year and is now preparing to scale up operations if the situation worsens, WFP spokesperson Gaëlle Sévenier told reporters in Geneva. She said the agency has funding shortfall of $160 million for its operation in South Sudan. Secretary-General Ban Ki-moon today voiced deep concern over continuing tensions along the border between Sudan and South Sudan, as well as the current crisis over oil, saying that the situation represented a worrying deterioration in the relationship between the two countries.